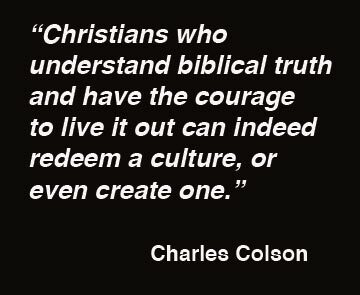 How many of you feel that we are not living in a Christian culture? 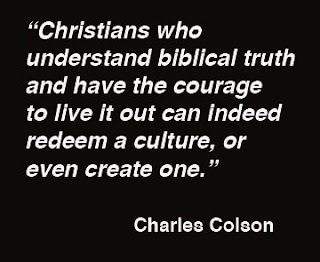 At the very least, I think we can say that our society and culture continually challenge us to live a Christian life. If we say, as a Christian, that the Bible is our guidebook or manual for living a life that is pleasing to God, then it is the Source by which we must evaluate our culture. First, we must understand that God is not disconnected, or distant from, or even outside our culture ... and He doesn't want us to be either! After all, He created us, and it is human beings who create the culture. Furthermore, we are not to shun the culture or fear it when it doesn't represent our Christian values. In reality, I believe that God wants us to be responsible for our culture; to be stewards of this world He created and to contribute to it and transform it. And when you look at our culture today ... the anarchy in the streets; the political and social division; the lack of moral absolutes ... it is easy to see that we have some work cut out for us. While acknowledging that we Christians have not been good stewards of the culture, I am choosing, at this point, to concentrate on how we begin to influence the culture moving forward. I know I have addressed this before, but it is easy to say that we are to love one another, and show compassion and mercy, and turn the other cheek -- all actions that imitate our Lord -- but it is sometimes difficult to equate Biblical principles when we hear that the Bible is outdated and it no longer speaks to our generation. How are we to incorporate the Bible into our responses to the culture? To begin with, we would do well to search the Scriptures for answers. There are good examples for us to follow in the Bible; examples that mirror what we are facing today. And while there are those who may think that this ancient Book could offer nothing to us modern 21st Century citizens, I want you to consider what Paul had to say about the culture of the city of Corinth, and how Believers were to respond to it. Believers in Corinth inhabited a culture which resembles ours in many ways. Like America, it was diverse ethnically, religiously, and philosophically. Like our nation, it set a standard [in the known world] for wealth, literature, and the arts. And it had a notorious reputation for its flagrant display of sexual immorality. Sounds like a brochure promoting life in America, doesn't it? So, how did Paul first reassure, and then instruct, the Believers in this corrupt city on how they were to live within this un-Christian culture? He really gave them a pretty ingenious plan to follow, and it is contained in 1 Corinthians 9:19-22: For though I am free from all, I have made myself a servant to all, that I might win more of them. To the Jews I became as a Jew, in order to win Jews. To those under the law I became as one under the law (though not being myself under the law) that I might win those under the law. To those outside the law I became as one outside the law (not being outside the law of God but under the law of Christ) that I might win those outside the law. To the weak I became weak, that I might win the weak. I have become all things to all people, that by all means I might save some. Note that Paul expresses the Liberty we have as Christians (I am free from all) to relate to all people. He is not suggesting that we be false in our appearance, but rather to put ourselves in the shoes of all that we meet, so that we might understand where they are coming from. Liberty is something that all Americans subscribe to, no matter what side of the political aisle they fall on. But we must make it clear to our culture that we recognize that our Christian life is one lived in the liberty of God's grace. The liberty we have is for the purpose of glorifying God. We must make it clear that a liberty, or a freedom, that condones sin is just another form of slavery. Although the protestors in our streets have the liberty to do so, we must make it clear that we do not condone violence or destruction of property. That does not glorify the God who created us all! On the other hand, while we must be sensitive to the pressing concerns of our fellow citizens, we must maintain the liberty to uphold our Christian standards. And speaking of protestors, how are we supposed to make our voice heard above all the dissenters, agitators, and demonstrators in our current culture? Well, Paul dealt with that, too. In Acts 17, the Bible says that while Paul awaited Timothy and Silas to join him in Athens, his spirit was provoked within him as he saw that the city was full of idols. The idols consisted not only of carved and graven images, but philosophies that had become cultural idols. Among these philosophies were the teachings of Epicurus (Epicureanism), and Stoicism, the foremost popular philosophy among the educated elite in the Hellenistic world and the Roman Empire. Do you see the similarities, and would you agree that the so-called "educated Elite" of our day have successfully made idols of themselves? Paul found himself being challenged on how to open up a dialogue, or communicate, with these philosophies that were at odds with Christianity. Epicureanism was embodied in the belief that "pleasure" was the greatest good, and that the way to attain such pleasure was to live modestly, to gain knowledge of the workings of the world, and to limit one's desires. Followers were religious skeptics, professing doubt in divine intervention or heavenly authority. Stoics maintained that it is virtuous to live a good life and maintain a will that is in accord with nature; that the way a person lived their life was the best indicator of his goodness... A Stoic would change his will to suit the world and remain, in the words of Epictetus, a Stoic philosopher, "sick and yet happy, in peril and yet happy, dying and yet happy, in exile and happy, in disgrace and happy." As one can see, these philosophies put the emphasis on man and his will and efforts. There was no consideration of the One who created them! We can likewise see that same idolatrous fixation on the ideologies of Materialism, Individualism, Relativism, and Secularism -- all of which have become idols of behavior in our culture. It was no different in Paul's day! But evidently, Paul was able to converse with any segment of the population. Why can't we become like Paul, and as alert, thinking, sensitive, concerned, discerning Christians, challenge ourselves to confront our culture in all of its diversity and pluralism? I will admit that it is easier to converse with those who are like-minded, but that is not our only responsibility. We must learn how to coexist with people who are different than us, and accept the challenge that Paul did in the city of Corinth ... that we might win more of them for the Kingdom of God. Yes, it is reported that Evangelicals were largely responsible for the shift in direction that our recent Presidential election seems to be indicating for our country and our culture. But we've got to do more than show up at the ballot box every four years. That alone will not influence our culture. Shouldn't we be trying to find the "points of understanding", or the common ground, and build from there? We must not isolate ourselves out of a spirit of arrogance or repulsion -- or even in orchestrated disapproval -- but insert ourselves into the culture, so that we might imitate Jesus and make Him known among the idolators. I suspect that just like Paul (in Acts 17:32-34), we will at first be mocked or sneered at; then there will be those who will say "tell us more"; until finally some might join us and believe. We must be fully prepared for God to be rejected, but equally prepared to share more of Him when asked; and ultimately we can hope to rejoice when the seeds we've planted fall on fertile soil. I know that's hard to imagine as we watch the coverage of the angry people in the streets and the continuous bashing of our Christian principles by the idol-worshippers in our land. 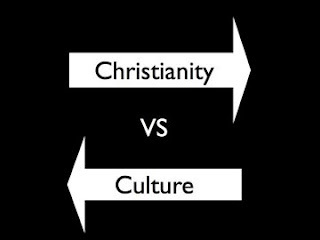 But in the end, I think it is incumbent upon we Christians to have a change of attitude about our culture. Instead of viewing it as an enemy that we must battle or defeat, maybe we should see the culture as a means [or a vehicle] to be used by Him and His people for His purposes. As we watch the continuing coverage of the animosity and anger in our culture, we see what a challenge there is before us. But it is no different than the challenge Jesus faced as He confronted the culture in His homeland, or the challenge that Paul and the other Apostles faced as they engaged the cultures of the ancient world. The question becomes this ... can we have the same impact they did? We certainly have the advantage of reaching more people, quicker and more creatively, than they did. But in the end, perhaps it is the simple knowledge of the Power of the Word -- the Word that speaks of true Liberty, Forgiveness and Repentance -- that is the most effective. Are we up to the challenge? Or has our culture convinced us to be silent, insignificant, and powerless? That is now how Paul and the other Disciples of Jesus dealt with their cultures. Hear me! There is a profound truth that we must face in our present day and culture ... yes, we are confronted with a daunting challenge, but we know that greater challenges await us in these Last Days! Now is the time to prepare for those greater challenges, and we need to learn how to trust God and to draw on His strength in this present challenge, in order that we might be strengthened spiritually, mentally, and emotionally for the greater challenges to come. As the Bible tells us, a perverse culture is going to be the least of our problems! Jeremiah 12:5 "If you have raced with runners and they have worn you out, how can you compete with horses? If you stumble in a peaceful land, what will you do in the thickets of the Jordan?"